When I went to Florida to visit Reggie Black, he showed me how to make delicious coffee in a stovetop espresso maker, or a macchinetta. Reggie, an excellent instructor, carefully explained how much water to put in the bottom chamber, how much coffee to put in the filter, and how to assemble the macchinetta correctly. He showed me how the filter plate and the gasket fit under the top chamber. I’ve been making delicious espresso every day since then; it’s changed my coffee consumption habits and it’s brightened my mornings with a new, cheery routine. Although I’m not enjoying the sociability of caffé, my early morning is filled with delightful smells and sounds which end with a little cup of warm delicious energy. After a lifetime of making coffee in various ways, this particular technique was the solution to a few of my coffee requirements. The macchinetta is small and aesthetically pleasing; space was limited at The Coop and I didn’t have room for a big old Mr. Coffee sitting on the counter. In the last few years, I had even taken to drinking instant coffee due to this space limitation. Stovetop espresso is also “green” enough for me and doesn’t produce much waste, unlike the “Keurig K-Cup” which commits the sins of both bigness and forever landfill life. I’m saving my coffee grounds now and mixing them into my garden for the worms. The best part of it all is that the coffee tastes good. On Sunday morning, I got up early with thoughts of taking a sunrise walk. I had taken my macchinetta apart the day before and had given it a thorough cleaning and inspection. I sleepily followed what I thought was my usual preparation pattern. Then the handle fell off. Ach, not such a big deal, the rest of the machine was intact, so I placed it on the burner and turned it on. I pattered about, writing my blog while waiting for my morning cup of wake up. I went over to the stove and adjusted the macchinetta and without knowing what was happening, the whole thing exploded, sending a spray of coffee grounds all over my kitchen. It even crossed the threshold of my bedroom and left a few coffee sprinkles on my dust ruffle. It was one hot mess before sunrise. 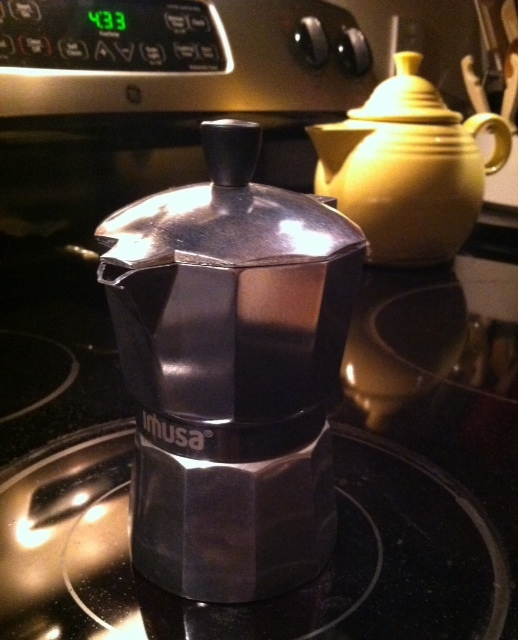 In my pre-coffee sleep walk, I had forgotten to put the filter plate and the gasket into the macchinetta! It knocked me off my game and I had no choice but to pull out mops and rags and sponges. It upset the rhythm of my day and it put me ninety minutes behind on a schedule I had hoped would include peace, quiet, and spiritual reflection. I never quite recovered yesterday and I could provide a long list of quips and motivational quotations about “overcoming” when things go wrong. But I won’t; it could have been worse. It could have blasted my eye out. I’m not going to let a little “Arabica Incident” get me down. This entry was posted in Experiments and Challenges and tagged coffee, Tom Brady, When things go wrong. Bookmark the permalink. You took that photograph at 0433 this morning? Ye gads! I’m now thinking that the steam pressure pushed the coffee itself up into the central column. That means, though, that the steam release valve didn’t work. If you didn’t see steam coming out of the valve before it exploded, it isn’t working right. Let some vinegar set on it for a few minutes, then scrub it with a stiff brush. One advantage of the overpriced Bialetti macchinette at that site is that all the parts are replaceable. In Italy, half an aisle of any grocery contains nothing but coffee makers and parts. Perhaps a Bialetti would work better for you down the line. Yes, LP, I was eying those shiny bright Bialetti machines!